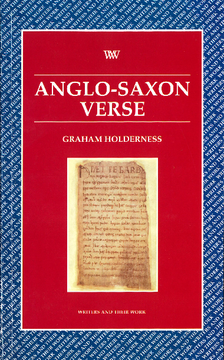 Almost everything of interest in Anglo-Saxon history is recorded in the poetry of the period: the historical and political, moral and ethical, theological and ecclesiastical, military and constitutional motives and preoccupations of that past culture are there to be read at the level of individual perception and personal experience. In this study Graham Holderness brings these Old English texts and the culture they embody within the reach of the general reader by providing powerful new translations of heroic, elegiac, religious and love verses, translations which span the corpus from Beowulf to The Wife’s Lament and bridge the gap between the unfamiliar language of their original composition and the modern English in which they are subsequently discussed and lucidly explained. As a general introduction to the subject this book opens up the language, literature and life of Anglo-Saxon England to the non-specialist, ending with a line by line, sample translation and detailed annotation as an impetus to further study. Graham Holderness is Dean of Humanities, Languages and Education at the University of Hertfordshire. He is the author of many critical and educational books including: D H Lawrence: History, Ideology and Fiction (1982), Shakespeare’s History (1985), Open Guide to Wuthering Heights (1985), Open Guide to Women in Love (1986), Open Guide to Hamlet (1987), Penguin Critical Studies of Richard II (1989), Romeo and Juliet (1991) and The Merchant of Venice (1992), Shakespeare: The Histories (1999), and has published numerous journal articles on Anglo-Saxon verse, textual theory, and literature and theology.